Cardboard never ceases to amaze. Having been deployed in gramophones, stereos and even digital cameras, one inventor now believes it can be used to make the ideal bicycle. Izhar Gafni, from Israel, spent 18 months just folding the material every-which-way in order to discover a strong enough design, and now he claims his technique is almost ready for mass production. His maintenance-free bike uses a "secret" mix of organic materials to make it waterproof and fireproof, and is then lacquered to give it a friendlier appearance. It's expected to cost a mere $20 and weigh about 20 lbs (9 kg) -- that's 65 percent lighter than an average metal ride. In fact, this bicycle doesn't use any metal parts at all -- the solid tires are made of reconstituted rubber and a car timing belt is used instead of a chain. It lacks the swank of a Faraday Porteur, perhaps, but then you could buy 175 of these for the same money. Want proof that it actually works? The bike's not-so-featherweight inventor takes it for a spin after the break. 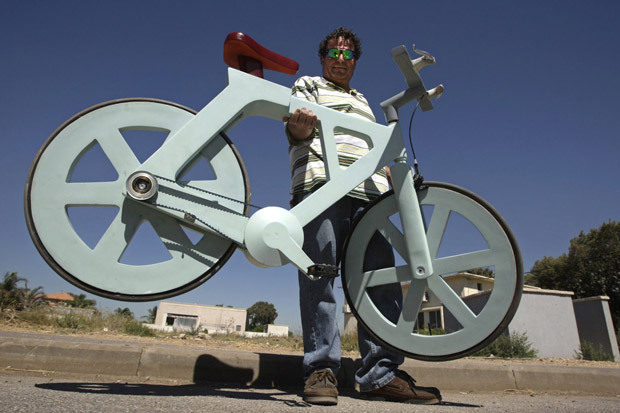 Cardboard bicycle 'close to mass production': tough, green and just $20 originally appeared on Engadget on Tue, 16 Oct 2012 12:27:00 EDT. Please see our terms for use of feeds.